I am in a company network so cannot check if port 1717 is free/allowed. Should I try to change the redirection URL to another port using a connected app ? I am a bit lost here. Any help much appreciated. Thanks ! You can set environment variables to configure some values that Salesforce CLI and Salesforce DX tooling use. Environment variables override CLI runtime configuration values. Seems like what's happening is, SFDX sets up a temporary web server on your own computer so that when your OAuth flow is finished, the browser has a way of handing the token back to SFDX and signalling that it's completed the flow. 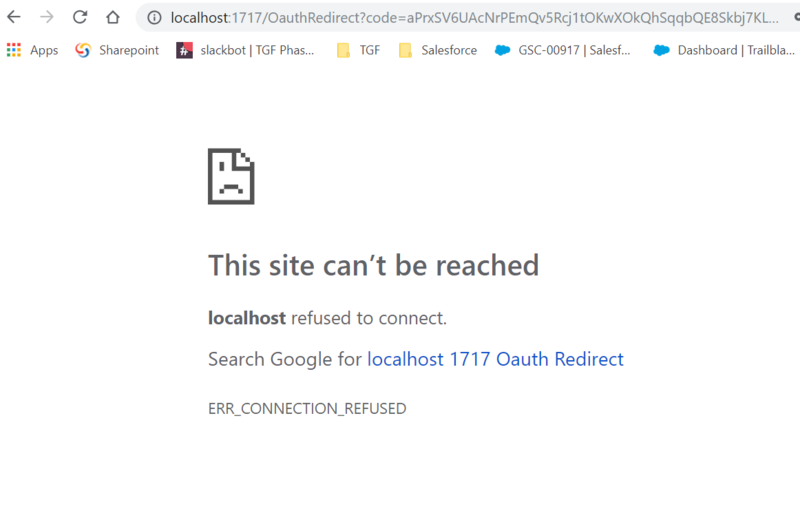 So if you are unable to reach that localhost:1717 URL... why? It's located on your own computer. So either you have an internal firewall that is blocking your computer from browsing to itself, or your browser is contacting something other than your local computer when it aims at "localhost" (hence why some suspected proxy settings). Or something has blocked SFDX from setting up the local server in the first place. OK, the OP's edit says that proxies are not the issue. Before looking too far afield, try looking at your event log for suspect errors; see if that helps you locate the source of the problem. from a CMD prompt. If "sfdx force:auth:web:login" still fails, remember to re-enable your firewall/AV :-). Try next disabling other software, like "Intel(R) Management and Security Status" or other things clearly related to security. If that fails to get "sfdx force:auth:web:login" working, you can try starting your computer in safe mode (many ways to do this, like run "msconfig" and tell your computer to boot in safe mode with networking; you can also often do this by banging the F8 key on boot, if you can get the timing right). Log in (in safe mode) and try running "sfdx force:auth:web:login" from a CMD prompt again; if it works, some non-essential service is stopping things from working. Remember to run run msconfig again and reset the computer for a regular boot, then reboot and continue - assuming you have rights to do this. and hit the spacebar until you get down to that line; note the process and kill it. There's more you can do, but eventually you'll want to grab someone with local knowledge, who can log into your machine and perform administrative tasks for you and troubleshoot. I'm hoping your employer sees this as part of doing your job. Not the answer you're looking for? Browse other questions tagged oauth vs-code or ask your own question. Salesforce Marketing Cloud/Exact Target API Authorization Endpoint for OAuth Authorization Code Workflow?